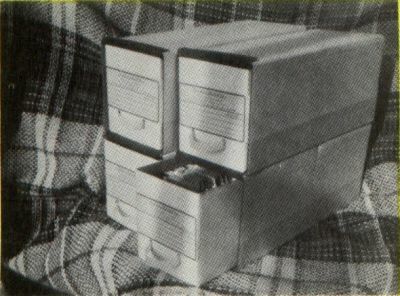 From Weber & Sons comes the new ArchiveDiskFile system #735, each file drawer of which will hold up to 75 3.5-inch disks. The files are constructed of corrugated cardboard and can be used singly or can be stacked and interlocked for greater capacity. According to Weber & Sons, over 675 disks can be stored in one square foot of shelf space. A pack of three files can be purchased for $21 or, for people with extra large storage needs, a 12-pack is available for $78 ($6.50 each). CIRCLE #132 ON READER SERVICE CARD.